This question got me thinking about amino acids and the ambiguity in the genetic code. With 4 nucleotides in RNA and 3 per codon, there are 64 codons. However, these 64 codons only code for 20 amino acids (or 22 if you include selenocysteine and pyrrolysine), so many of the amino acids are coded by multiple codons. Is there any hypothesis as to why there are only 22 amino acids and not 64? Is it possible that there were 64 (or at least more than 22) at an earlier time? especially the "Reality intrudes" section. Basically people had created fancy mathematical reasons why it has to be exactly 20. Nature, being nature, does not follow the reasoning, but has its own ideas. In other words there was nothing especially special about 20. In fact there seems to be a slow grafting of a 21st amino acid, selenocysteine using the codon UGA. Also pyrrolysine is considered the 22nd. The last section suggests that the code was originally doublet, so coded for <16 amino acids. This can partly explain why the third base in each codon is not as discriminating. So perhaps in the year 2002012 someone will be asking on biology.stackexchange why there are only 40 amino acids. The first position of the anti-codon, the "Wobble" position, forms hydrogen bonds less well than do the second two. This means that the last position of the codon has less coding potential than the first two. 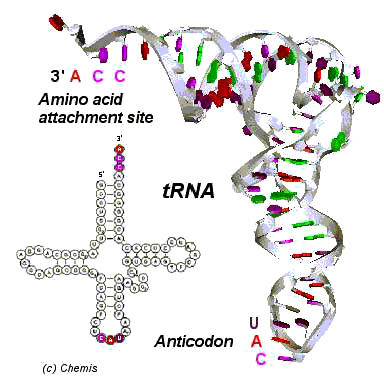 The reason is that the anticodon is at the bottom of the anticodon loop of the tRNA, and so there backbone of the tRNA is bending back to pair with itself. The nucleotides do not hold their bases flat and regular in relation to each other. Here is a picture of the anticodon loop. In this case 5'-CAU-3' is the anticodon for 5'-AUG-3', so it would be the C, right at the sharpest part of the bend in the anticodon loop, that would pair poorest. Here is an interactive model where you can spin the tRNA/mRNA around and see that not all the hydrogen bonds are equal length, nor are all the bases coplanar. There are two other ideas to throw in here. 3) some biochemists have proposed that there is a sense that the 20 amino acids we have are a fairly stable set - that adding other amino acids don't help create better proteins. Peter Schultz learned some of this as his group really wanted to add extra, human synthesized amino acids into native proteins. I was at a talk where he noted that attempts to make cysteine with a longer side chain caused the amino acid to cyclize to form a thioolactone. Thinking along these lines adding another CH2 group to proline might not make packing better. There is probably some value, but just not enough to disrupt all the sensitive machinery for making and realizing the genetic code. Not the answer you're looking for? Browse other questions tagged biochemistry evolution genetics amino-acids or ask your own question.